Edgar Jones explores how British people responded to air raids during the Second World War, and what this tells us about coping under extreme stress. The declaration of war in September 1939 exposed civilians in Britain not only to the prospect of an invasion but also to the threat of chemical weapons. Planners believed that Germany would conduct an intense aerial campaign, dropping not only incendiaries but also bombs filled with poison gas. In autumn 1938, 38 million gas masks were issued and Air Raid Precautions (ARP), a civil defence organisation established in 1924, trained people in their use; decontamination centres were set up and the emergency services taught first-aid for toxic exposure. In the event, German raids focused on London and for eight months, from 7 September 1940 to 10 May 1941, the capital was bombed on a nightly basis. Then, having failed to invade the UK, Hitler turned his attention to the Soviets and a period of relative calm followed. Yet, in summer 1944, just when people thought that the war was as good as won, V1 and V2 rockets brought death and destruction back to London and the South East. This article explores the impact of air raids on civilian morale (see also Jones et al., 2004) and whether are there any lessons to be learned about people’s capacity to cope in light of the current terrorist threat. In the build-up to war, military planners and healthcare professionals judged that the British people lacked the coping skills to resist a determined bombing campaign. In a best-selling study, Wilfred Trotter, professor of surgery at University College Hospital, argued that the instinct of ‘gregariousness’, which drew people together in time of crisis, would not provide sufficient protection in time of total war. Without the formal bonding and discipline found in hierarchical groups, such as the armed forces, he predicted that civilians exposed to prolonged danger would collapse into an ‘undisciplined civil mob’ with a propensity to ‘panic’ (Trotter, 1919, pp.150–151). Trotter drew on the ideas of the French anthropologist, Gustave Le Bon, who had argued that individuals absorbed within an heterogeneous crowd became impulsive and irritable, losing the capacity to exercise judgment (Le Bon, 1897, p.35). Observations of how Londoners behaved when subjected to air raids during the First World War appeared to confirm Trotter’s belief in the inherent weakness of heterogeneous groups. In the context of a high-casualty war, Zeppelin airships and Gotha bombers killed relatively few UK civilians (1239 in total). Yet, between 100,000 to 300,000 Londoners took shelter in Underground stations, whilst a further 500,000 were thought to have sought refuge in basements and cellars. This behaviour was interpreted by the Committee of Imperial Defence (CID) as evidence of lack of resolve. The CID, which in 1937 estimated that a 60-day aerial bombardment would kill 600,000 and wound 1.2 million, believed that the psychological impact would be ‘out of all proportion greater’ than the physical effects, fearing ‘a disorderly general flight’ from the capital (Titmuss, 1950, p.18). As a result, the primary aim of ARP services was ‘the maintenance of the morale of the people’ (Anon., 1937). Plans were laid for some 17,000 regular troops and 20,000 reserve constables to be drafted into London to control the expected mass exodus from the capital and to prevent panic at mainline stations. Despite these pessimistic forecasts, Trotter had offered a crumb of hope: homogeneity could be fostered by finding roles for civilians and by reducing inequality created by ‘the social system of class segregation’ (Trotter, 1919, pp.155–156). The pessimistic forecast of the CID proved wildly inaccurate as a total of 146,777 civilians were killed or seriously injured in the UK during the Second World War. Of these, 80,397 (54.8 per cent) were in the London region (O’Brien, 1955). Historians are divided about the impact of this mortality on morale. Not surprisingly, the official historians, O’Brien and Titmuss, argued there was no panic and that the health of the nation actually improved during wartime. Dissenters from this position include Angus Calder (1991, p.109), who argued that Britain in 1940 provided ‘ample evidence, familiar and unfamiliar, to indicate widespread fear and paranoia bordering on panic’. Clive Ponting (1990) maintained that the ‘Blitz spirit’ owed more to government propaganda and a censored media than to reality. What evidence, then, survives from the period to inform us about the people’s morale? At first, the government relied on anecdotal reports from officials and surveys commissioned from Mass-Observation. However by autumn 1941 the Ministry of Home Security had directed its Research and Experiments Department to investigate the impact of air raids on morale and productive output, using a range of measures from absenteeism and sickness from work, destruction of houses, content analysis of newspaper reports and population surveys (Overy, 2014). Because of the real threat of chemical weapons, the government commissioned population surveys to assess the percentage of people carrying their respirator as an indicator of readiness. On the outbreak of war, it was estimated that 75 per cent of people took their gas mask with them but the absence of air raids saw the proportion fall to 5 per cent by spring 1940. Defeat in France and the Dunkirk evacuation witnessed a temporary rise to 30 per cent, but by the time the Blitz hit London the Home Office reported ‘there is no evidence that a large proportion of people anywhere now carry their gas masks’ (Anon., 1940, p.2). Intelligence officers at the Home Office interpreted a low level of mask carrying in Liverpool in January 1941 as an indicator of high morale and civilian confidence. However, the final phase of the Blitz, when U-boats were sinking record tonnages of Allied shipping and German forces advanced through the Balkans, saw the carrying of masks in London again become a common sight (Calder, 1969). Evidence from the First World War suggested that soldiers who had been trained in anti-gas measures and habituated to the threat in the front line coped well during gas attacks. Civilians in the Second World War were never tested, but evidence from Japan (where in March 1995 the Aum Shrinriko cult released sarin into the Tokyo subway) and Israel (where during the first Gulf War some misinterpreted the detonations of Scud missiles as chemical weapons) suggests that bombs filled with mustard gas or anthrax would have eroded morale. In April 1941 Tom Harrisson, one of the founders of Mass-Observation, created a controversy by writing to the BMJ to suggest that doctors had missed an epidemic of hidden illness caused by the psychological effects of air raids. Traumatised civilians, he argued, simply went to bed and stayed there as stigma deterred them from going to see their family doctor. Although a number of psychiatrists denied his claim, anecdotal evidence suggested a significant increase in psychosomatic disorders. Felix Brown, a psychiatric registrar at Guy’s, observed an increase in cases characterised by medically unexplained symptoms in patients with no history of mental illness (Brown, 1941, p.687). In August 1940, after a series of raids on Bristol, D. Molesworth, an official in the intelligence branch of the Ministry of Home Security, interviewed a panel doctor based in Filton, a northern suburb of the port, who reported an increased incidence of indigestion cases, and estimated at least 15 per cent absenteeism from work after severe bombing (Molesworth, 1940; see also Jones, 2012). Edward Glover, a London psychoanalyst, argued that civilians suffering from the trauma of air raids tended to express their distress as bodily sensations and were either treated as cases of apparent organic illness or suffered without referral (Glover, 1942). To convince the US government that Britain had not lost its resolve in the face of German air raids, Aubrey Lewis (1942) was asked to provide a report on ‘the incidence of neurosis’. Based on GP records, admissions to casualty and mental health units, he found no significant increase in psychiatric morbidity and concluded that most of those who broke down after bombing had a history of vulnerability to stress. If the surveys conducted by the UK government were accurate and there was no evidence of a collapse in morale or a significant rise in psychological casualties, why did the 60,595 civilian deaths appear to have so little impact? The crude explanation is that the mortality rate remained relatively low given the size of the urban population and the length of the conflict. In London, the 29,890 deaths represented 0.3 per cent of the capital’s population. The highest rates were in Plymouth and Coventry, where in both towns 0.5 per cent of residents were killed (Anon., 1948). However a number of psychiatrists argued that the health effects of the conflict might not be revealed until the return of peace. Aubrey Lewis (1943, p.27) warned that the full effect of ‘war-related stress’ might be delayed and that ‘the evil harvest may be reaped afterwards’. The ‘stiff-upper-lip’ culture and a desire not to appear defeatist may indeed have deterred people from reporting traumatic illness. A national survey of mental health services conducted in 1943 by Dr C.P. Blacker found that many directors of psychiatric clinics believed that ‘latent neurosis’ existed in the civilian population. Whether this developed into overt psychological or psychosomatic disorder after the war was dependent on ‘the social and economic conditions… and the moral atmosphere which prevailed’ (Blacker, 1946, p.175). The availability of employment and positive attitudes towards work were considered important mediators in helping people to manage the long-term effects of air raids. 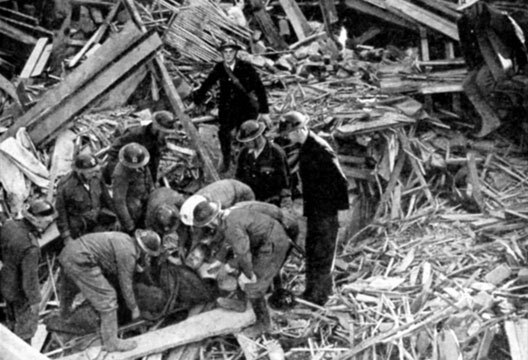 In a sense, the narrative of the Blitz and modern terrorist attacks such as the London bombings of 7 July 2005 are similar in content, focusing on resilience and compassion exhibited by civilians and members of the emergency services. Although very different cultures mediate the expression of distress, we can perhaps conclude from the Second World War that people are more resourceful than planners predict, and that the heterogeneous crowd can be both adaptable and supportive. Anon. (1937). Minutes and report of the Warren Fisher Sub-committee of the CID on ARP Services, 30 June 1937 (The National Archives, CAB16/172). Anon. (1940). Intelligence Branch Fortnightly report for 23 August 1940 (TNA, HO199/455). Anon. (1948). Chronicle of main air attacks on Great Britain… and of their effects on the vital national war effort. (TNA, HO201/42). Blacker, C.P. (1946). Neurosis and mental health services. London: OUP. Brown, F. (1914). Civilian psychiatric air-raid casualties. Lancet, 1, 686–691. Calder, A. (1969). The people’s war: Britain 1939–45, London: Jonathan Cape. Calder, A. (1991). The myth of the Blitz. London: Jonathan Cape. Glover, E. (1942). Notes on the psychological effects of war conditions on the civilian population. International Journal of Psychoanalysis, 23, 17–37. Harrisson, T. (1941). Obscure nervous effects of air raids. BMJ, 1, 573. Jones, E., Woolven, R., Durodié, B. & Wessely, S. (2004). Civilian morale during World War Two: Responses to air raids re-examined. Social History of Medicine, 17, 463–479. Jones, E. (2012). The Gut War: Functional somatic disorders in the UK during the Second World War. History of the Human Sciences, 25, 29–47. Le Bon, G. (1897). The crowd: A study of the popular mind. London: Ernest Benn. Lewis, A. (1943). Mental health in war-time. Public Health, 57, 27–30. Molesworth, D. (1940). Bristol and Cardiff: State of public morale from 2 to 6 Aug 1940 (TNA, HO199/276). O’Brien, T.H. (1955). Civil defence. London: HMSO. Overy, R. (2014). The bombing war: Europe 1939–1945. London: Allen Lane. Ponting, C. (1990). 1940: Myth and reality. London: Hamish Hamilton. Titmuss, R.M. (1950). Problems of social policy. London: HMSO. Trotter, W. (1919). Instincts of the herd in peace and war, London: Ernest Benn.